Nutmeg – Not Just For Decorating Eggnog! Nothing says “Holiday Cooking” like the distinct aroma of nutmeg! Does the smell of nutmeg conjure up the image of a warm, sweet, glowing kitchen? Being safe and warm by the fireplace when the wind is howling and the snow is blowing? When I smell nutmeg, I always think of eggnog–or at least eggnog latte! However nutmeg is a very versatile spice because its unique flavor is soft and rounded and can blend well with a lot of other things. Nutmeg is an appealing addition to hot chocolate or cocoa. Or how about your regular coffee or tea with a pinch of nutmeg? Wash the Brussels sprouts, take off any brown layers and cut them in half. Then slice just through the stem end to split it so it will cook evenly with the rest of the half pieces. Peel the shallots and thinly slice them. Pan-fry your chopped pancetta or tempeh bacon in the oil. Do this for a few minutes and then add the chopped shallots and cook those for a minute or two. Finally add the Brussels sprouts and a pinch or two of sea salt. Keep stirring to keep things moving. If you want to, you can add just a touch of water at the end to finish the cooking. When the Brussels sprouts are tender, add the pepper and sprinkle with a bit of nutmeg–maybe 1/8 teaspoon. All these cozy images and comforting foods with nutmeg can fool you. 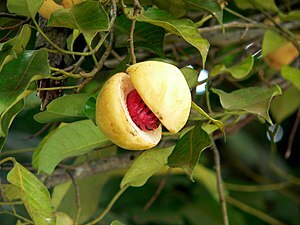 Nutmeg is actually a seed from inside the nut of a tropical fruit that is indigenous to Indonesia–the Spice Islands–and India. It makes a very nice addition to curry powder. As you may know, curry powder is not the name of an individual spice. It is a combination of spices blended together and used in many warm-climate cuisines. 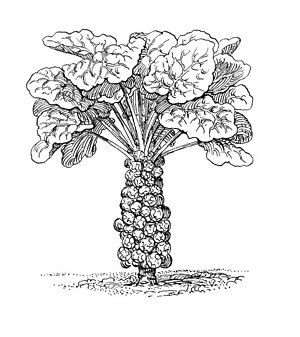 Let’s see what you can do with this by adding it to fish, using it as a rub on broiled tofu, or seasoning a Mediterranean-style pasta and vegetable dish. Or? Tell us what you come up with. All of that holiday-warm-and-cozy imagery comes to me naturally just by catching the aroma of nutmeg. But I have heard that if you take a great deal of it you can suffer hallucinations and delirium. I have no idea how much nutmeg you’d have to ingest for that to happen, but my common sense is my guide. Too much nutmeg would be difficult to take because the strong aroma and unique taste just don’t lend themselves to large portions. A little goes a long way! I have also heard that nutmeg is not good for small animals. So don’t be slipping your dog any holiday eggnog or holiday Brussels sprouts! This entry was posted in Cooking, Food, Recipes and tagged Brussels sprout, Eggnog, Fakin' Bacon, holiday cooking, Nutmeg, nutmeg spice, winter squash soup by mycookinglifebypatty. Bookmark the permalink.